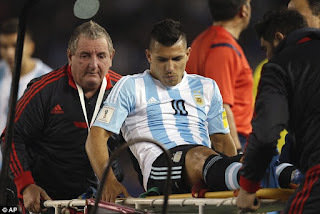 Manchester City Sergio Aguero and David Silva down with injuries ~ CK Jacob: Nigerian Fiction And Lifestyle Blog. A big blow to Sergio Kun Aguero and Manchester city as last time out he had an amazing showdown with 5 goals in 20 minutes, if he suffers blows throughout the season it will be a problem a huge problem. Next week they travel to Old Trafford to face their local rivals Manchester United without Sergio Aguero and David Silva on the squad paper it will be tough times for Man City. @Zaeem It was a great game for Manchester City yesterday. Sterling scored 3 goals! It won't be easy facing their rivals but I want them to win.